Recently while planning a project of a cherry desk with Queen Anne legs I was having a difficult time deciding how to attach the skirt boards to the pillars of the legs. The options were to use mortise and tenons, biscuits, or dowels. Each of which created their own set of problems. Using biscuits I felt that there would be lack of strength and alignment difficulties, mortise and tenon would be difficult as a jig would have to be created to hold the pillars while mortising as well as not having a mortising machine, so using dowels was the chosen method. Searching the internet for doweling jigs I found many listed with costs ranging from really inexpensive to the ridiculously expensive and many were made in China. I have looked at DowelMax, Veritas and others but with those tools extra accessories had to be purchased separately to do the work I wished to complete. I then came across a listing for Joint-Genie® and from research the tool has been available for a while but only marketed in the USA using the company’s web site based in England. They offer several different kit combinations both in metric and imperial. One of the problems I had was, “how to accurately obtain the skirt board set back, reveal, on the leg pillar?” After watching the videos on their web site it was quickly seen that the ease of adjustment using the face spacer tabs allowing centering the holes to a specified set back and the positioning along the length of the pillar could be done by this tool very fast and with repeatable results. I ordered the Joint-Genie® Craftsman Kit in the 3/8” size. The tool was received in five days and came in its own case including the drill bit and brass depth stop collar; all of true quality made from case hardened steel with stainless steel adjustment fittings. Not only did I use it for the skirt board attachment with painless effort or measured layout, I also used it in the glue up of the desk top and desk case sides with equally little effort. When I sanded the top and sides I found that because of the accuracy of dowel hole placement, minimal sanding was needed on the glue lines. Out of the box Joint-Genie has simplicity of use, accuracy, speed and greater versatility, in other words dollar-for-dollar it does more for less and is made extremely well. It does look like they are distributed in the US. How did you get one? Looks interesting but does it handle angled joints? Have not tried on angle joints but in their video at the web site they show that it does work with miter joints and other angles. I purchased Joint-Genie last summer and used extensively for a while. in a row, a slight misalignment makes it really difficult to assemble. otherwise have to spend a lot of time switch the position of bars. I think Dowell Max is better though it costs more. As I said, I have not used it on angles but I really do not understand what you mean by “not a wide surface”, I use it extensivly on 3/4” to 1.5” thick and have had no problems with alignment from 2” to 48” edge length . What thickness of material are you using? So far I have had no problems in any of the applications. What size jig did you get? By the way, I posted this same review on another site after I posted here and I was beat up about the head and shoulders accused of trying to market the tool. Let me say to you what I said to them, I own one (now also the 1/4” which I am using for shelf pins in cabinets), I use it, and I very much like it so as an alternative to others out there felt you and others should know about it. However, that being said, I would love to know how it got on a third site which I am not a member, said at the bottom of that sites web page got from an RSS feed or something, anyway. Update to the project and uses for the Joint-Genie. As I did not have a shelf pin drilling jig I got the 1/4 inch Joint-Genie bar and am using it to drill the shelf pin holes before assembling the cabinet which will rest on the top of the desk. Putting two shelves in the cabinet and as I am making two desks, therefore two cabinets. 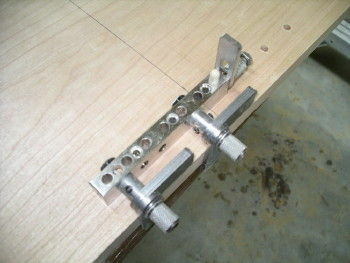 I got the idea from here Jig (half way down the page) after looking at different shelf pin jigs. I have taken a square and drew lines across the face of the sides of the cabinet before the cabinet is assembled and align the end of the tool to that line then drill one hole. 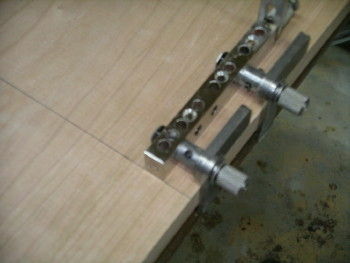 Put a dowel in as an index pin and to hold the tool, then drill the rest of the adjustment holes for that shelf. 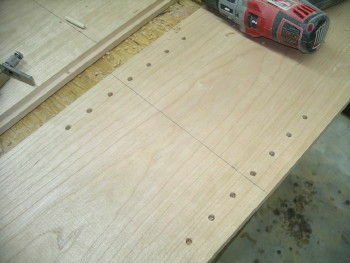 Perfect spacing from the edge of the sides and perfect spacing of the holes vertically. Takes about five minutes to do all of the holes where before, measure mark center punch, then drill, this is much faster. Had to put the desk project to one side, ran out of Cherry and waiting for my new load to come in so I can complete the 2 of them. As soon as I get further along I’ll post some pictures. Finally got my supply of Cherry in and here are the shots that I promised to put up showing how I used the ¼” Joint Genie to drill shelf pin holes. I added a spacer to each bolts (1/4” drill stops that I had) because I wanted to push the face spacer tabs out so I could get the holes in about 1 ½“ from the edges of the case sides. I then drew a center line across the case sides of the cabinet and made sure that they were measured from matching ends of the case sides. Lined up the end of the drilling bar to the line, held it tight by hand and drilled the first hole. Put a 1/4” dowel in the first hole and drilled the rest of them by indexing the bar off that first hole that had the dowel in it. All of the holes on both case sides took no more than five minutes to drill and they were perfectly spaced and all the same distance from the edge. I’m just putting the desks top cabinet case together and when I get it together I’ll put up more pictures.